I don't know about you, but I just love snowflakes! The new December Release from Our Daily Bread Designs is filled with beautiful snowflakes. Inspired by this weeks Mojo Monday Sketch, I've combined three of the new snowflake sets along with the coordinating die to create my card. The Snowflake Background is stamped in Chocolate on Blue card stock, the edges of the panel are sponged in Ranger Gathered Twigs Distress Ink. The sentiment is from Our Daily Bread Designs Snowflake Sentiments set stamped in Chocolate on Vanilla card stock, then cut with Spellbinders Petite Labels and layered on a Chocolate panel. 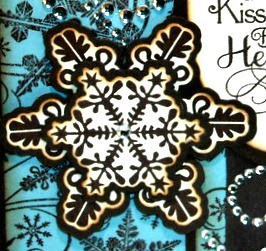 The snowflakes are stamped in Chocolate on Vanilla card stock, then cut with the Custom Snowflake Die. I wanted to add a mat layer, so I created and cut the mat layer from Chocolate card stock using the Silhouette. To embellish I added Zva Creative Crystals (CRS-02CB-101), and a piece of Walnut Brown Vintage Seam Binding. Those snowflakes are beautiful! I love the color combination you chose as well. Fabulous combination of the blue and chocolate, Lisa. This is such a lovely card. How I love chocolate and blue together. Well, I love chocolate with anything but now we are talking the eating kind! lOL!....anyway, your card is so very pretty, Lisa! Chocolate kisses, hmmm, making me want some yum yums! Such a pretty card, Lis!! Gorgeous use of the snowflakes. Love the brown and blues together!